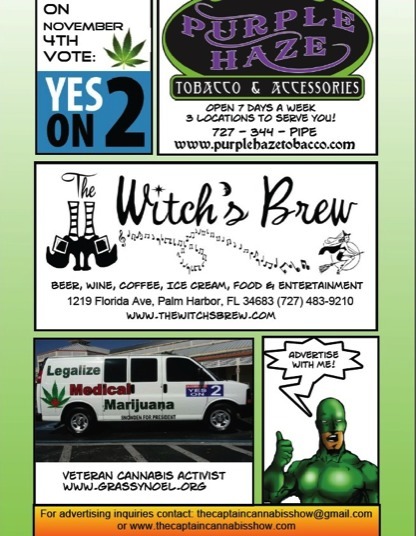 Become a part of America's "Cannabusiness" SPONSOR the Show or ADVERTISE with us! Have a product or service that you want to market and promote to the growing hemp & cannabis consumers in America? Advertising and Sponsorship opportunities exist to help support the broadcast and put out more comics books. Choose to be a Sponsor, and your brand message is shared across all channels. That's the Official Captain Cannabis website, Facebook, any event I attend, as well as a graphic overlay and back link description on our hundreds of videos. Advertising is the option to choose if you just want your message in the comic book, or in select videos. Everyday more states voting populations are putting pressure on their politicians demanding Hemp & Cannabis legalization & reform. Now is the time to push the scale in favor of the people. Share your passion for legalization by supporting The Captain Cannabis "Weed Media" and Cosmic Crusaders, LLC. entertainment & publishing endeavors. Contact the Captain for more information.